1932 - Franklin Roosevelt was elected president. The New Deal was President Roosevelt's plan to bring the nation out of the Great Depression and prevent it from ever sliding down so far again. The New Deal was primarily about providing people with security by insulating them against risks associated with the industrial, market economy. The biggest New Deal program, Social Security, provided pensions for older persons who left the labor force and provided benefits for workers who became disabled or died and their dependents. This program was intended to insulate families from the vagaries of the labor market. Unemployment insurance provided the same kind of security against temporary fluctuations in the labor market. Aid to Dependent Children was also intended to protect individuals who were not connected to the labor market through a gainfully employed wage-earner. The minimum wage was designed to prevent pauperism among the gainfully employed and also to stimulate demand by putting money into workers' pockets. Roosevelt also intended the minimum wage law as a lever to lift the South out of agrarian poverty and backwardness. Stock market regulations required corporations to provide at least some minimum amount of information to shareholders and prospective shareholders. 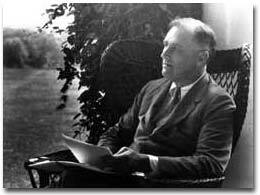 Roosevelt intended to reduce the amount of speculation in the markets. Bank deposits were insured by the federal government so that individuals were insulated from the effects of bank failure. The New Deal contained many other features that did not survive scrutiny by the courts or which out-lived their usefulness. Franklin D. Roosevelt. Courtesy of the Library of Congress.